When you are injured in an accident that wasn’t your fault you may be entitled to file a personal injury claim to seek compensation for your injury, loss of earnings and other damages resulting from the accident. One of the most common questions that we are asked by new clients is: Do I have a Personal Injury Claim? There is no quick or straight forward answer to this question because each case, accident, and injury will vary. The concept behind an injury claim is that it provides a way for a person (regardless of citizenship), who was injured in an accident that was not their fault, to seek compensation for losses they incurred as a result of an accident. In order for you to have an idea of how strong your case may be you will need to speak with a personal injury attorney. They will be best placed to assess your claim and tell you how strong or how likely you are to have a successful case or if there are any factors that may be negatively affecting your claim. For road accidents, a truck driver has a duty of care to other motorists, pedestrians, motorcyclists and bicycle users when using the road. To satisfy this first element will mean that we must be able to state confidently that the person who caused the accident has a duty of care towards you. The second element of a successful injury claim is proving that the person at fault was in breach of their duty of care. For car accidents, this may mean that a person swerved into your lane and caused an accident, did not stop at an intersection, turned into your lane or failed to keep a safe driving distance from you and did not break in time and hit you. In slip and fall accidents, this may mean that the staff of a shop did not put a wet floor sign down having just mopped the floor and you slipped. It could mean that a property owner failed to keep a safe environment for you and you injured yourself on their property. To satisfy this element, we must be able to prove that the person at fault did not exercise their duty of care towards you but also prove that you didn’t contribute to the accident. This is known as contributory negligence and if proven you may not have a successful claim. The third element of a strong injury claim is known as causation and this means that the breach in duty of care case the injury you sustained. The causation doesn’t have to be 100% related to the injury but must have contributed to the injury you sustained. For a car crash, this could be that the person behind you rear-ended you because they were speeding and this caused your injury. For an accident at work, this could be that your employer provided faulty protective equipment and you sustained an injury while carrying out your job. To satisfy this element, you will need to show expenses incurred and medical records. Your attorney will help you in gathering these documents and from that be in a position to advise you how much they think your claim is worth. 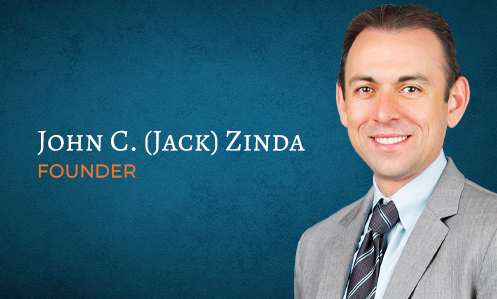 Filing a personal injury claim with Zinda Law Group can be broken down into a 3-step process. Our attorneys will be with you every step of the way and make the claims process as straight forward as possible for you. Your health is your wealth and it is of utmost importance that you seek medical attention straight away following an accident or injury. Once you have received medical attention, you should speak with a lawyer as soon as possible. We offer 100% free consultations to help you understand your position better, without having to worry about consultation fees in the process. Our attorneys will assess your case and based on their experience be able to advise you on whether they think you have a case. If you have a strong case, your attorney will then take the time to investigate your claim and in doing so will gather documents needed to file your claim. This will also include requesting medical records, as you will need these to prove your injuries. At this time there is very little you need to do. Your attorney will walk you through each step of the investigation process. 3. You focus on recovery, while we focus on settling your case! At this point, your attorney has gotten your claim under control, will reach out to the party at fault and settle your claim. One common worry a client may face is that they will have to attend a trial – this is generally not the case. The majority of cases are settled before ever having to set foot into a courtroom. In the unlikely event that your case should proceed to trial, your lawyer will keep you informed and updated at every step of the way. Our nationwide injury lawyers are on hand to help you navigate the legal process. We know that it can be daunting to file a claim for the first time. That is why we have everything covered, allowing you to focus on your recovery while we focus on settling your case. We have the knowledge and resources necessary to help you build the strongest case possible and seek maximum compensation for all the ways your injury has cost you. Our firm also believes that an injury victim should never have to worry about their ability to afford excellent legal representation. That is why we offer 100% free consultations, and why you will pay nothing unless we secure a favorable settlement, judgment, or verdict for your personal injury case. That's our No Fee Guarantee. Call Zinda Law Group today at (888) 671-5127 for a free consultation with one of our experienced personal injury lawyers.